Apparently all Pirates need a telescope and I have been reminded everyday for weeks now. I have been trying to locate a cheap telescope but have not had any luck so when the last bit of kitchen roll got used up this week I had a lightbulb moment and thought I could help BBto make one. We had to wait for a toilet roll tube to come free and then we could get going. The toilet roll tube is thinner than the kitchen roll one so it fits inside. We painted both tubes black. We then edged the toilet roll ends with silver foil. It was easier to just wrap a strip round rather than cut and stick a thin strip. I then found a pirate picture off the internet to print off, cut it out and stuck it to the side. Just search Pirate skull and crossbones! The final step was to cover both tubes in sticky back plastic and cover both ends with it. We then fastened the smaller tube into the larger tube with sticky tape. I am sure there is some really clever mechanism we could have used to make the inner tube move in and out but I was not creative enough to think of that. It did make my day that when finished BBkept saying ‘look at my new toy!’ Just goes to show they are not that bothered by fancy, it just has to be the part. ...and a pirate needs a telescope to find his treasure! Anyway another bit to add to our pirate dressing up box to go along with the treasure map we made a few weeks ago! Professional…ha ha! But we try. This is great – I love how authentic you have made it with the pirate symbol on it as well. It is actually there to make the craft more obvious, in case it is so bad people can’t tell what it is! Great idea! These would be a fun craft for a pirate themed birthday party too. I am going to do this with my little pirate. Arrrr! Yes that is a great idea for a party! You would need a lot of toilet rolls! That is a really good tip! I shall remember that for next time. The sticky back was a bit fiddlely. The simple ideas are often the best. Mine would love that telescope! Thanks hon. Do use it as your boys will love it with their pirate ship! What a simple but excellent toy to have made. I wonder if The Boy will get into pirates when he’s a little older? 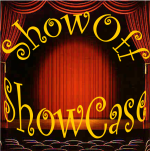 Thanks for linking up to ShowOff ShowCase and apologies for the delay in commenting. We’re having a pirate activity week Kerry, I know this will make you smile. It’s actually very hard to do pirate activities without any reference to cutlasses and walking the plank! I’ve just made my own (well I haven’t, The Boy did!) pirate spyglass because of this post of yours.